Healthier You has been caring for the dietary and nutritional health of people on the Mid North Coast of NSW for ten years. Our team of Accredited Practising Dietitians and Nutritionists use the latest evidence-based medicine and advanced technology (including sophisticated body composition analysis machines) to care for clients with a broad cross-section of conditions. We specialise in helping people achieve a target weight to manage various chronic conditions. These include obesity, cardiovascular disease, diabetes, hypertension, PCOS, IBS, low weight, eating disorders, food allergies, osteoporosis and those simply wanting a nutrition makeover or an improved diet. Healthier You includes an Accredited Sports Dietitian to help people in training or in quest of their fitness goals (working with a number of entrants to the annual Port Macquarie Ironman over the years). Primarily offering one-on-one consultations, Healthier You also works with nursing homes and offers corporate work and group presentations. Several times per year, we offer supermarket tours advising how to meet your nutrition goals when shopping and provide a variety of educational resources (cookbooks, nutrition label guides, e-newsletters and more) all targetted at making a healthier you. Healthier You cares for people in the private sector, accepting private patients, Medicare referrals (we offer bulk billing) and DVA patients. Healthier You was established in 2006 by Peter Clark with a mission to inspire people to lead healthier lifestyle and maximise their enjoyment from life. 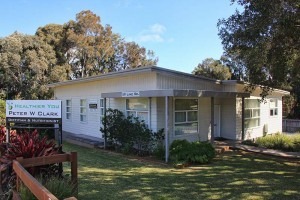 Since then, the practice has expanded to become one of the largest dietetic practices in Port Macquarie, with a number of satellite offices to serve the population of Port Macquarie, Laurieton, Kempsey, Wauchope and surrounding areas. Healthier You prides itself on providing straightforward, easy to understand, individualised advice to help each client meet their nutrition goals. Every visit, a client has their body composition recorded to help them track changes in muscle and body fat and to inspire them towards their health goals. Everything about our practice is targetted at inspiring people towards the goal of a healthier life. Whether young or old, in good health or poor, we believe that an improved diet can help you get more out of life and make for a healthier you.